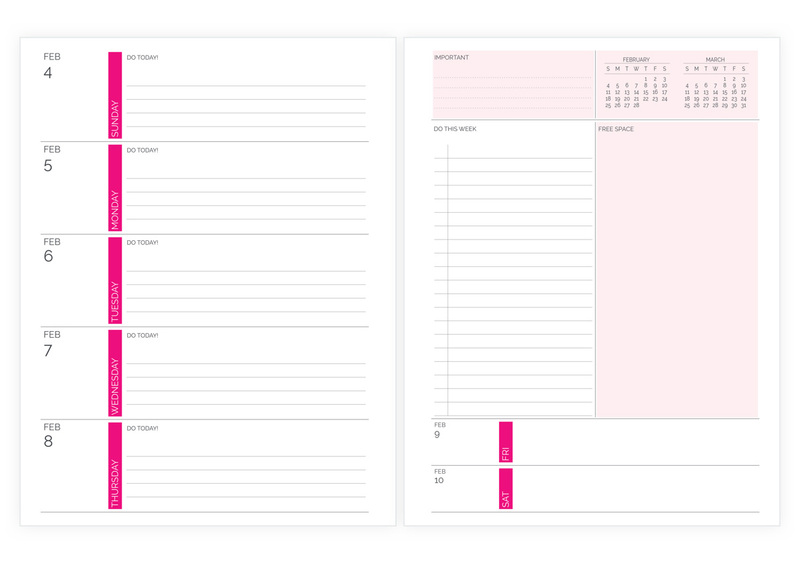 We’ve just added a new insert size, the same as our medium planner. These 7” x 9” un-punched pages will fit a variety of mid-sized binders. If our letter-size inserts have always been too big for you and our Filofax A5 and Franklin Classic inserts have been too small, then this size may be just right. And you can use them them with all the configurations and models that are currently available with our medium-size planners. Agendio.com has a new website! Agendio is now erasable pen-friendly! We like to keep you up to date on our latest improvements. So we’re happy to share with you that all of our pages are now printed on presses that are erasable pen-friendly. You can now use erasable pens, such as Eraser Mate and Frixion, on any agendio product. We know it’s not the new year, but we just wanted to let you know that agendios starting in January 2018 are now available. They were scheduled for the end of summer, but many of you asked us to make them available earlier, so they’re ready now. You want to add tables to your planner but you wish you could adjust the width of each column depending on its use. Now you can. 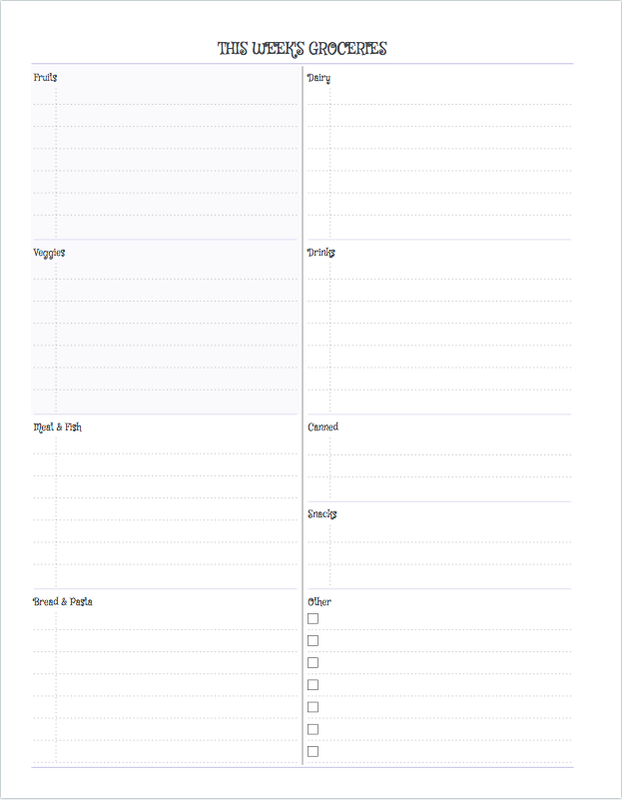 On the Extra Pages page, choose the “Flex Tables” category, find a model with the number of columns you want, add your labels at the top of each column and then customize the width of each column to suit your needs: Make them wider for names, narrower for progress checkmarks or numbers. 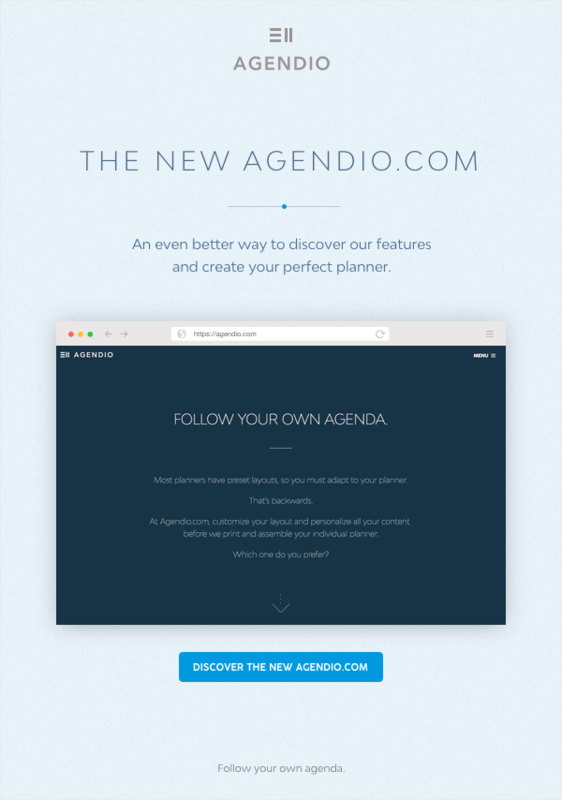 As with all Agendio features, you can customize it so it suits your needs. Please notice that the customize column for Flex Tables has two tabs/panels: One for your labels and one for customizing your lines and checkboxes and shading. You now have so many options that they don’t all fit in one panel anymore! Once you give it a try, please use our feedback page to let us know what you think, if you like this new feature and how you would make it even better! We now offer Habit Trackers! Do you need tracking pages in your agendio to keep track of what you do, what you eat or how much you exercise? 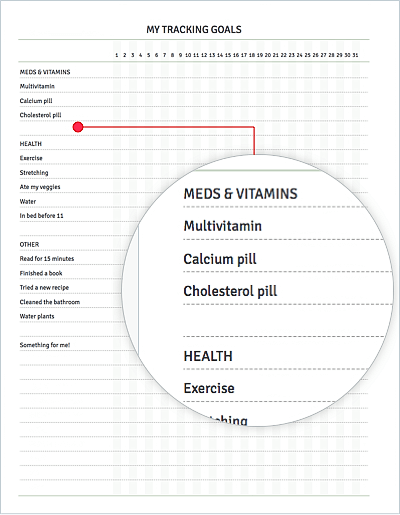 Do you want a paper record to make sure you take your vitamins and pills every day? If you need to track these or any other things, you can now use our new customizable Tracker Pages. 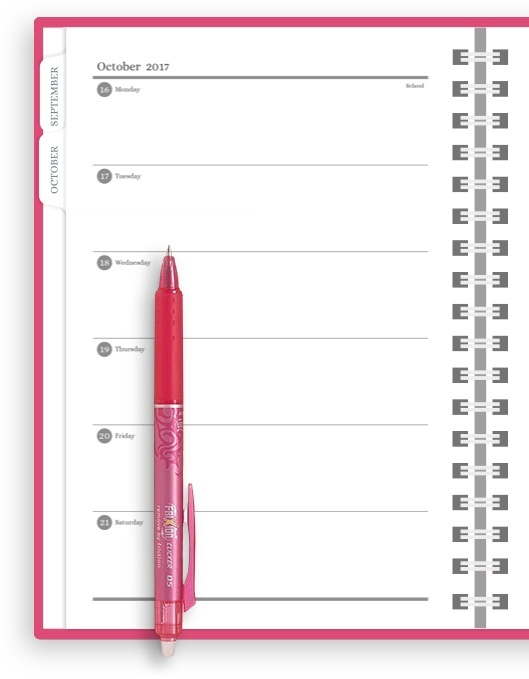 We offer yearly by month, monthly by day and weekly by day formats, and, depending on the size of your planner or refill, they are available in both full page and half-page formats. You’ll find the tracker pages in the Extra Pages section of the builder, after Future Month and before Music. We have now added help videos to the builder. 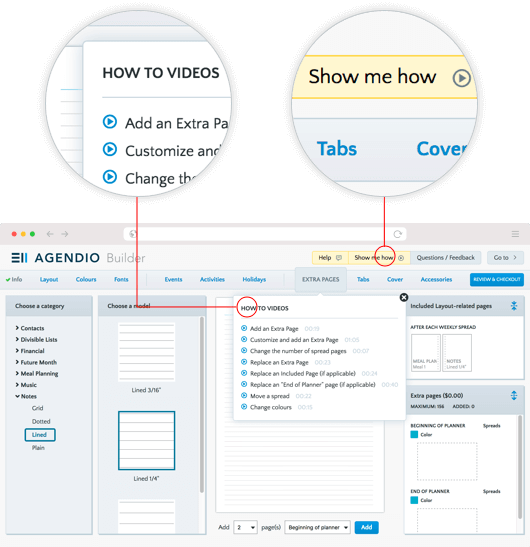 In case you’re having difficulties understanding how to customize your extra pages, or maybe it’s all clear except for one detail, we added eight videos to the extra pages section. It shows how to do anything related to extra pages, including how to add pages, customize them, replace included pages, select the number of pages to add, where to place them within your planner and much more. After you check them out, please let us know what you think. We’re thinking of adding some help videos to other builder pages as well, but first we’d like to hear back from you: Do they explain well? Are they the right length? Whatever you think, good or bad, whatever the issue, we’d love to hear now before we make more of them. You asked us for more cover designs. 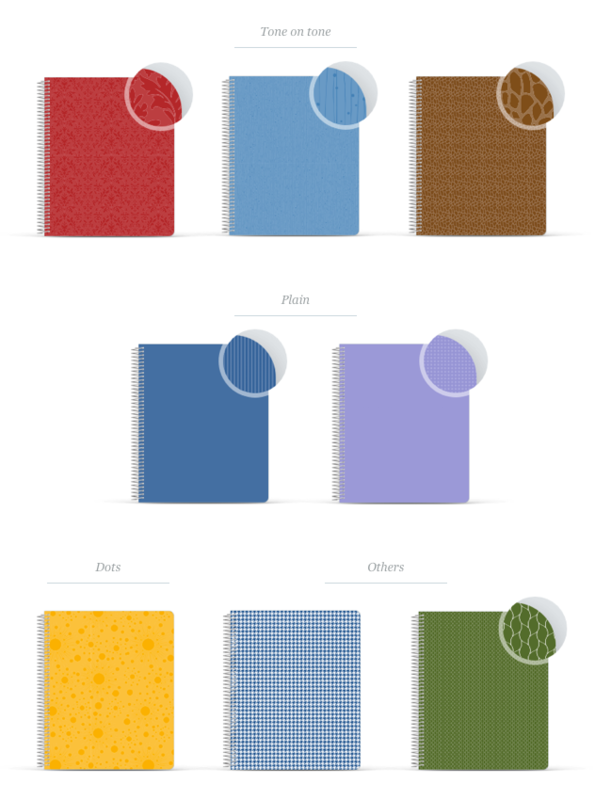 So we have added eight new designs, including an entirely new section, “Tone on tone”, two new varieties of plain covers, as well as more covers in the “Dot” and “Other” categories. Keep the suggestions coming and feel free to send us more PNGs and JPGs of cover designs you like! Introducing the Agendio divisible Extra pages! 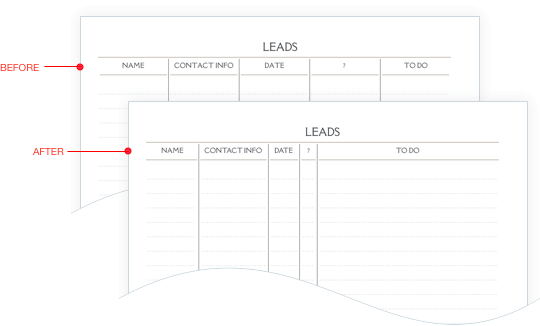 Full-size pages with either one or two columns, each of which can be divided into 1 to 8 pagelets, and each pagelet with it’s own label, lineage, checkboxes and shading. To try them out, go to the Builder, to the extra pages tab, and look for Divisibles in column 1.